I started to write about these, then I remembered I posted about wings a while ago, and then I realized that this recipe is almost the same as that one. Oops. The good news is I took new pictures and am reposting, with some modifications. These are great, easy, and you should make them if you're having some sort of Superbowl party. If not, take advantage of the fact that wings should be on sale because of the Superbowl. Otherwise known as sticky, delicious, sweet, spicy, addicting wings. Preheat the oven to 450. 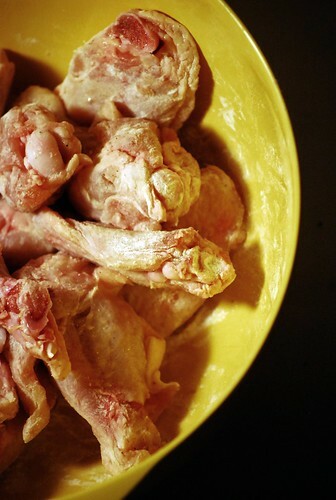 Dredge the chicken wings in the flour and sprinkle with salt and pepper. Heat the oil until it shimmers, and brown the wings on all sides. While the wings are browning, combine the remaining ingredients in a microwave-safe bowl. Heat 30 seconds to a minute and stir well. 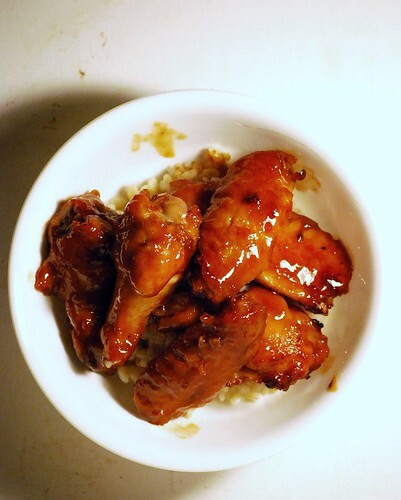 Dump the browned chicken wings in the bowl with the sauce, turn to coat, and spread them out in a glass dish. Bake 15 minutes, flip, then bake another 10-15, until the sauce is thick and sticky and the wings are cooked through. Serve over rice. I've been dreaming about vegan wings, will let you know if we actually make them -- will definitely use your recipe for the sauce if we do!!! These sound great! I didn't know that Dynasty hoisin sauce was GF! I've been making my own! Definitely making these. Love the glaze! Looks so delicious! Looks yummy. In case some of your readers can't find Dynasty hoisin sauce, www.crockpot365.blogspot.com has a good recipe for GF hoisin sauce. Since I missed your first wings post, I am very glad that you posted these luscious looking morsels. Love the sticky, sweet sauce. I'll have to try yours...soon!